Ibrox Noise: How do managerless Rangers avoid this huge pitfall at Ibrox? 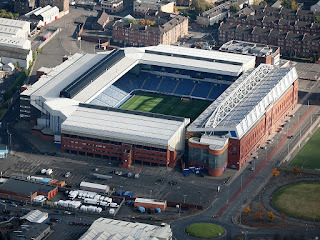 How do managerless Rangers avoid this huge pitfall at Ibrox? This morning's Murty chaos has thrown a further spanner in the works; when we published this piece some weeks ago, we got a lot of derision from our fellow fans who found the idea laughable. We understood the rebuttal as well, after all, it SHOULD have been laughable. But the trend was set and the decline had well and truly begun, following and including that loss at Ibrox to Celtic – Rangers have only won two of seven matches and one of them was against a Dundee side who were actually better than Rangers on the day, but just not clinical enough. And now managerless Rangers sit perilously close to failing to even qualify for the Europa League qualifiers – we currently reside in third place, but it’s a precarious setting with a resurgent Hibs deeply threatening to go past. Lennon’s men have beaten, in succession, Scotland’s two most in-form sides in Celtic and Kilmarnock, and have momentum – they have now probably replaced Killie as the best of the current rest in Scotland. Meanwhile at Ibrox form has been dreadful at best and disgraceful at worst, and few would now truly bet against Rangers failing to even make third place. In that article we quoted earlier, we did posit two scenarios which have not come to pass – we feared fifth place – thankfully Kilmarnock’s dramatic loss of form (we feared them winning the lot) has seen them lose any chance of gaining fourth, so we are guaranteed fourth at worst. But that means no Europe, and on current form that seems worryingly likely. It also means a massive loss of potential revenue, from the potential hundreds of thousands for progression through the qualifiers to the prize of millions for entry into the group stage. And it would mean a significant loss of SPL prize money revenue too. Rangers need the £2.3M for finishing second – fourth is £1.72M – while £600,000 isn’t a fortune, that’s enough for one very good player who can make a difference in Rangers’ team. A player like Greg Docherty who cost that amount. Rangers simply need to pick up. A fourth placed finish is a disaster. It is a complete disaster and while Rangers teams have finished there before, the cost this time both financially and football wise is colossal. But the problem is we now go into three matches in a row against three teams quite simply superior to us – despite Killie’s recent drop in fortunes, they’re still a better team than us over the past five matches with three wins. And even in their loss to Hibs managed three goals. Add Aberdeen and Hibs and Rangers really are in a pickle. Now with no manager it gets even more daunting - Jimmy Nicholl and JJ will take the team for the weekend. Even finishing third is now a tough ask. I would agree how much is it going cost to get SG and his team?and then some new players he wants even on a free we still would have big wages to pay out,some one at 30/31/32 is going go where he can get the most money he is not going go where his pal is and take £2k when he could get £30k plus,so it could be he would need for this season £25/30 million he may only keep four players and sell the rest,this is back to the start but it looks like the only way forward.will this be enough to catch them am sure they are watching just to see what money we are going put down then do likewise come on lets get SG in and get this show on the road we can do it. Notice anything in common about them?? They are bricking it and hoping against hope that we get a "safe pair of hands"
I think runner up in the Scottish Cup gets the 4th spot pal!!! Only the WINNER of the Scottish Cup gets a Europa league spot. No European place is given to the runner-up. This was once the case but no longer and was stopped a few years back. No, rules have changed only scottish cup winner gets euro spot, when the winner's already qualified then the spot goes to the 4th team in the table. So if we dont secure the top 3 finish we must count on Celtic winning treble for us to qualify. Which one would you choose? So if we finish 4th do you cheer Celtic on to win a double treble or put up with no Europe next season?? ?